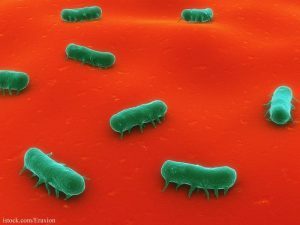 A study published by the Centers for Disease Control and Prevention has found that Salmonella enterica is increasingly resistant to drug treatments. The subspecies S. enterica Kentucky showed greater resistant to treatment with the antibiotic ciprofloxacin in Canada. These infections are linked to travel to countries in Africa. The bacteria isolates were studied by the Canadian Integrated Program for Antimicrobial Resistance Surveillance from 2003 to 2009. Thirty percent of those isolates showed ciprofloxacin. The proportion of S. enterica Kentucky isolates that were resistant to ciprofloxacin grew from 22% in 2003 to 57% in 2009. These resistant bacteria emerged in Canada during that time frame. The CDC report states that “one of the main drivers of antimicrobial drug resistance in Salmonella spp. is use of antimicrobial drugs in food-producing animals. As with cephalosporin resistance, ciprofloxacin resistance in Salmonella spp. is a growing concern.” The researchers want to see more studies to determine risk factors for contracting these infections in Canada.